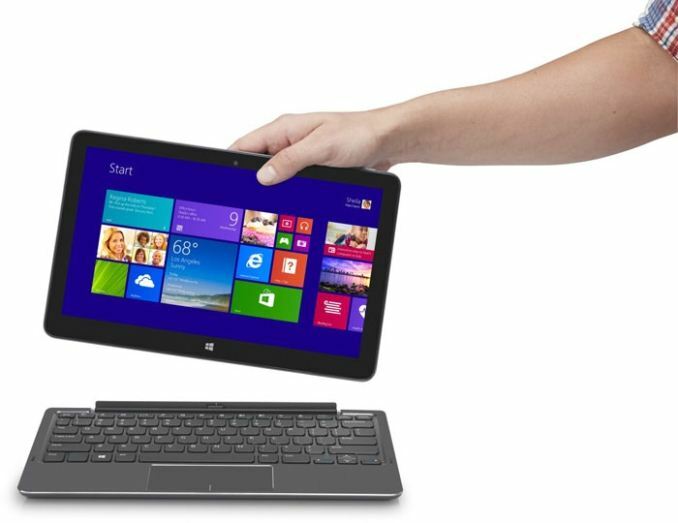 Back in November, Dell took the lid off of their Venue 11 Pro 7000 refresh which is their first tablet offering to have Core M powering it. Dell is aiming this tablet squarely at the enterprise segment, but with prices that start low enough for consumers to take a look as well. Starting at $699, it is not an inexpensive device, but it does offer some compelling features on top of the powerful (for a tablet) processor. 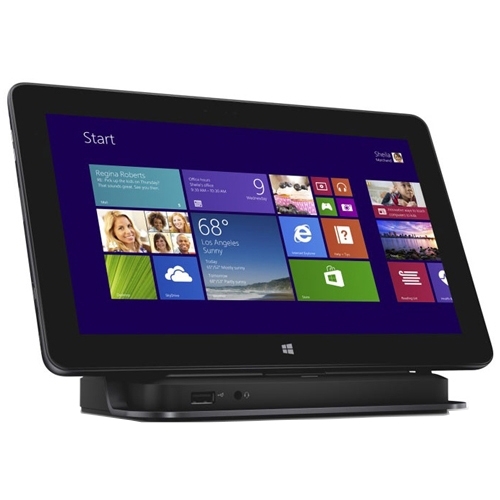 Dell has an entire range of accessories for the tablet to let the end user get the maximum out of the device, and allows the device to be used as a tablet, a laptop, or even a desktop computer. Dell has leveraged the Intel Core M processor to power this tablet, which gives it quite a bit of a performance boost over most tablets. There are two offerings as well, with the Core M-5Y10c being the base model, and the Core M-5Y71 being the upgrade. Those who opt for the 5Y71 will enjoy the benefits of Intel vPro as well as the peak performance boost of the faster clock speeds of that model. The Venue 11 Pro 7000 (henceforth called Venue 11 Pro) is truly an Ultrabook in a tablet form factor, with 4 to 8 GB of memory on tap, 64 to 256 GB of solid state storage, and Windows 8.1 64-bit powering the system. Dell has an optional 4G LTE modem as well, which is something that still seems to be a rare feature on these types of systems. While the Venue 11 Pro is a reasonable tablet on its own merits, what really makes this device is the accessories. Dell has practically everything covered too. If you need a keyboard and extended battery life, they have that. If you want a thin keyboard only, they have that too. A stylus? Check. Docking station? Of course. How about just a case that can be used as a stand? Yes. 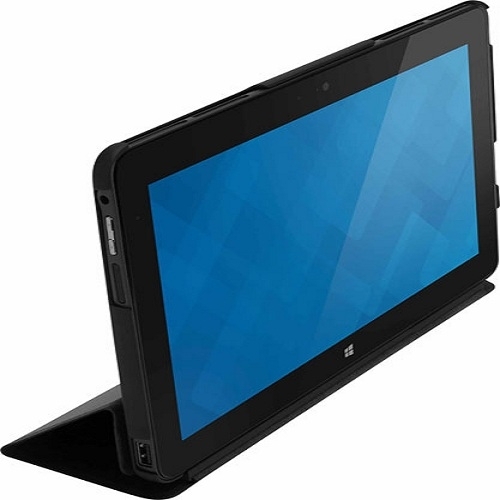 The folio includes a polycarbonate rear shell which keeps access available to the tablets ports. The front cover will fold behind and double as a stand. Dell sells this case for $24.99. This slim keyboard is very much like the Microsoft Surface keyboard covers. Very thin, and yet they feature a keyboard and trackpad. Dell did not send this accessory with the review unit, so I can’t comment on the key feel, but they do claim it has a tactile response. It also features an integrated tablet stand, which of course would be required since this tablet has no way of holding itself up. At just 3.6 mm thick, it is very much similar to the Surface Touch cover in thickness, and it will add 313 grams to the total tablet weight. The magnetically attached cover is going to come with the same drawbacks of the Microsoft Surface line of attachable keyboards. Although it is thin and light, it really works best on a desk rather than in a lap. While it can be used in a lap in a pinch, it is not ideal. The Slim keyboard is priced at $89.99. For those that want to use the tablet as a convertible laptop, the Mobile keyboard is likely your best bet. The tablet locks into the hinge of this keyboard, and with that proper connection it can be used just like a laptop – albeit a small laptop. The 10.8 inch display means that the accessory is much smaller than a traditional laptop keyboard would be. While the keyboard itself is sized pretty well, it is really the trackpad that suffers, since it is very small. Dell offers one great feature with this keyboard though. It includes an additional battery, which bumps the tablet’s battery capacity to around 60 Wh total. That is a huge amount of battery for a low powered device, and can really extend the usable lifespan of the tablet which we will see later in the review. All is not perfect with this keyboard though. First, the price is a very high $179.99. The keyboard and battery costs almost as much as the HP Stream 11 laptop. If it was a premium accessory, perhaps the price could be justified, but there are some major gripes I have with the keyboard. The keys themselves are very mushy and not a great typing experience. Also, there is no backlighting offered, which limits the usability in many scenarios. The trackpad was also not very good. Besides the limited surface area for it, it would often miss taps and it was frustrating to use. The hinge also lifts the rear of the laptop up, and while Dell’s solution is much better than the ASUS Zenbook which does the same thing, ergonomically this benefits no one. Finally, the mobile keyboard adds a lot of thickness and mass to the overall tablet package, with the keyboard coming in at 8.9 mm thick, and a staggering 794 grams. 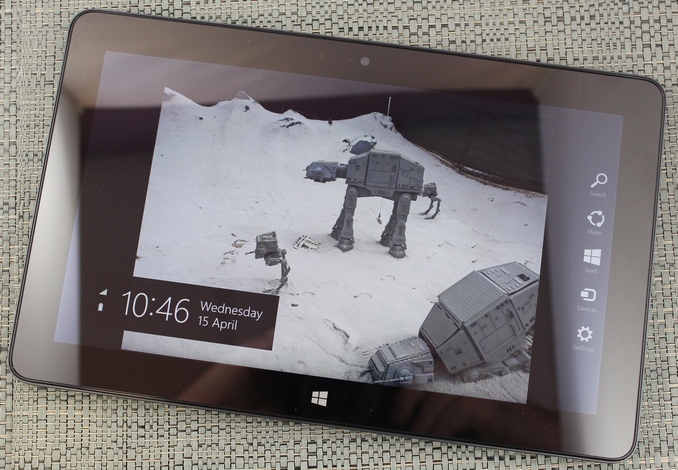 It actually weighs even more than the tablet on its own, over doubling the effective weight. The keyboard can be charged separate from the tablet, but the power connector has to be plugged into the tablet if both are connected together. 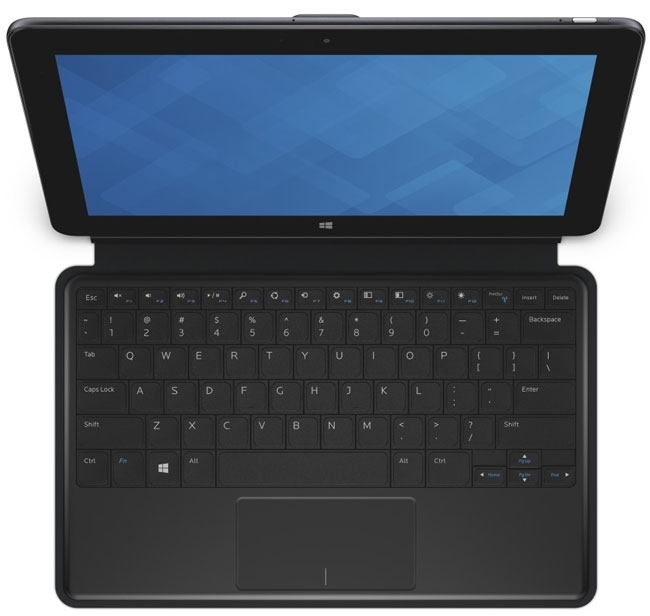 It would have been nice for Dell to put the keyboard charging port on the side of the keyboard to allow the power connector to hook up there instead of the side of the tablet when it is being used as a laptop. I do not really have a lot of good things to say about this accessory other than it does do a good job of increasing battery life. Dell’s Active Stylus is a Synaptics unit. There have been several revisions of the pen, and the previous Venue 11 Pro also supported an active stylus. Dell has a new model available now, and the new pen works very well. It is smooth to use on the display, and there was never any moments where connectivity would be lost. I am not a stylus expert like some people (ie Gabe at the Penny Arcade) but I had no issues using this model of stylus. The only slight issue was using the pen at the very edges of the display, where the pointer would sometimes jump right to the edge. Unlike the mobile keyboard, the tablet dock is very well constructed. The frame is made out of a piece of stamped steel which is painted black, so it is plenty sturdy. The mass of it also makes it feel well constructed, and the entire bottom is covered in rubber to keep it from moving around on the desk. Once docked, the tablet basically transforms into a full desktop. There are two USB 3.0 ports on the rear of the dock, and another on the front. The dock includes 10/100 Ethernet, HDMI, DisplayPort, and has a front headphone jack. The dock also includes a 65 watt power adapter, which should easily power the system and any USB accessories. The best part of this dock is the relatively low price at just $79.99. No idea why i even clicked , Core M is a horrible product for the price so got no interest at all in anything with it - hopefully AMD. Nvidia ,Qualcomm and ARM will catch up in single threaded perf at a fraction of the price soon. Well,maybe not ARM since A72 seems to be actually smaller than A57 , die size wise. So with the top Core M single core performance around 60% higher than the A8X, Apple will need to produce a miracle. Apple has a lot of relevance here, because they've got the ARM core with the highest single threaded performance. If anyone closes the gap to Intel it's going to be them. Even if Qualcom could do it, they need to put 4 cores into phones for the "bigger is better" crowd, which means any single core must not be too big - otherwise people will complain that it gets too hot. Apple is not a reasonable purchase so it doesn't matter, even if they have 2 times the perf it's not relevant in the real world. It is true that the Android guys do need more cores in general but it's also true that Intel doesn't design it's cores for this kind of TDP. And do remember to compare sustained perf and burst perf. I don't know for sure the core size for Broadwell on Intel's 14nm or A57 on 14nm Samsung but likely 7mm2+ vs bellow 2mm2 so A57 must be some 4 times smaller. For Apple 2 cores plus cache are some 12.5mm2 on 20nm TSMC but the cache is not very die efficient and on 14nm Samsung the 12.5mm2 would be closer to 10.5mm. For A72 ARM claimed 2.4GHz sustained clocks on 16nmFF+ in phones and it appears they mean quad cores. It also appears that A72 is smaller than A57. The numbers i've seen were core size 3.3mm2 , quad cluster(so with cache) 18.7mm2 but not certain about process, i believe it's on 28nm but that could be wrong. A72 at 2.4GHz should be pretty good and it remains to be seen what's the burst perf and how it clocks at higher TDP. It's not impossible for it to be close enough in tabs. We should see the dual A72 @ 2.4GHz on 28nm from Mediatek soon in tabs (some early benchmarks are in the wild already) and later this year the Qualcomm midrange phone SoCs with A72 at 1.9GHz and that will give us a better idea about what kind of clocks would be needed on 16FF+ and 14nm. No Nvidia has the ARM core with the highest single threaded performance.